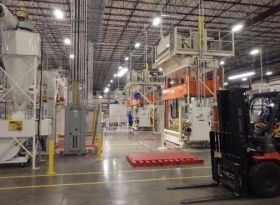 Spanish auto supplier Grupo Antolin has opened a 13,750-square-meter U.S. factory in Kansas City, Missouri, that will produce headliners for the Transit van made nearby at Ford Motor’s Kansas City assembly plant. The $18 million (13.2 million euro) plant has an expected production capacity of 3,500-4,000 headliners a day and will create 118 jobs over the next two years, the company said in a statement. The statement said Grupo Antolin is joining several other suppliers expanding in Missouri, including Janesville Acoustics, Yanfeng USA Automotive Trim Systems, SRG Global, Adrian Steel, Toyota Bodine and Martinrea Riverside. Headquartered in Burgos, Spain, Grupo Antolin operates 22 factories in 25 countries, including nine in the United States. The company produces a variety of interior parts and lighting products for automakers worldwide, including Ford and General Motors. Grupo Antolin ranks No. 56 on the Automotive News Europe list of the top 100 global suppliers with worldwide sales to automakers of $3.5 billion in 2012.